We had a play date this weekend and hubby was busy finishing off our Utility room, which meant me entertaining 4 children, including a tornado toddler for approximately 3-4 hours. Alone. Loki is 2 now but I’m not ashamed to admit there are still some weekends I struggle keeping all three of the boys entertained. Group activities are hit and miss. Generally they start off enthusiastically, then it ends with one of them crying, one of them huffing and Oren plodding on quietly ignoring my desperate pleas to help clear up the inevitable mess. I love crafty, arty activities but finding one for all 3 is not always easy. The weather was pretty grim so I needed to come up with something indoors. I had the Tula prepped and ready for an emergency back carry, (if removing Loki from the situation looked like the best option), then did a quick Pinterest search and made a list of ideas. Eat the Easter chocolate nests??! Hope Oren’s friend gets picked up early!!! Turns out I didn’t need to worry at all. It was a thoroughly enjoyable afternoon. I didn’t need multiple snacks or a Tula shaped toddler restraint; I just needed some paint (Okönorm) and some cotton buds (Organyc) – both from Babipur! I drew egg shaped ovals on some craft paper from my stash and using our saved up milk bottle lids (knew they’d come in handy), filled them with paint and added some cotton buds instead of brushes I set the kids to task decorating their own eggs. The rough plan was to try and get enough to make some bunting (who doesn’t love a bit of bunting?!). Over 2 hours passed, time in which Loki had very delicately and deliberately painted his face, his hair, the dog and a shockingly large amount of my new tablecloth but he had a great time and my new tablecloth is machine washable! Loki was strapped in a wee chair booster up to the table and was just so happy to be there blethering away to himself and the others. Edward, (who I had the most concerns about and who I was fully prepared to throw into his room with his tablet) also had a great time. He did a couple of “Easter” eggs then did a whole range of Ninjago themed eggs with different colours for the different Ninjas and their respective elements. I left him to it, he isn’t generally creative so I was delighted to see he was working away quite happily and independently. Edward was sharing and swapping paint with Loki too, which was a fab bit of sibling bonding. Oren and his friend (*cough girlfriend) had a blast. The two of them get on so well and they feed off each other which makes them really easy to work with. They plotted and planned their creations, took time sharing colours and waiting for the other to catch up, then each inspired by the other tried to imitate each other’s eggs. It was just lovely to watch. We did a bit of colour mixing too because the green we had wasn’t the right shade and apparently the orange looked like an egg, which was too yellow, but we needed orange like an orange so we had to make our own. I went over the primary and secondary colours with them and then we all made completely different shades of purple which was fascinating. We only stopped because Loki rather hilariously filled his nappy and I had to change him. We made about 30 eggs between us and they were beautiful! The bottle tops all went to be rinsed and kept for more crafty shenanigans. The paint was eco friendly so all the paper cotton buds went in the compost and the dining table was filled with wet eggs to dry waiting to be cut out and strung up. 3 and half hours flew past, all the kids behaved and appeared to have a great time. Edward and Oren both asked to do more colour mixing so I’m going to do colour wheels with them next. We had a quick and extremely belated snack of mini eggs and milkshakes and then the play date was done! I think we’ll definitely do this again. 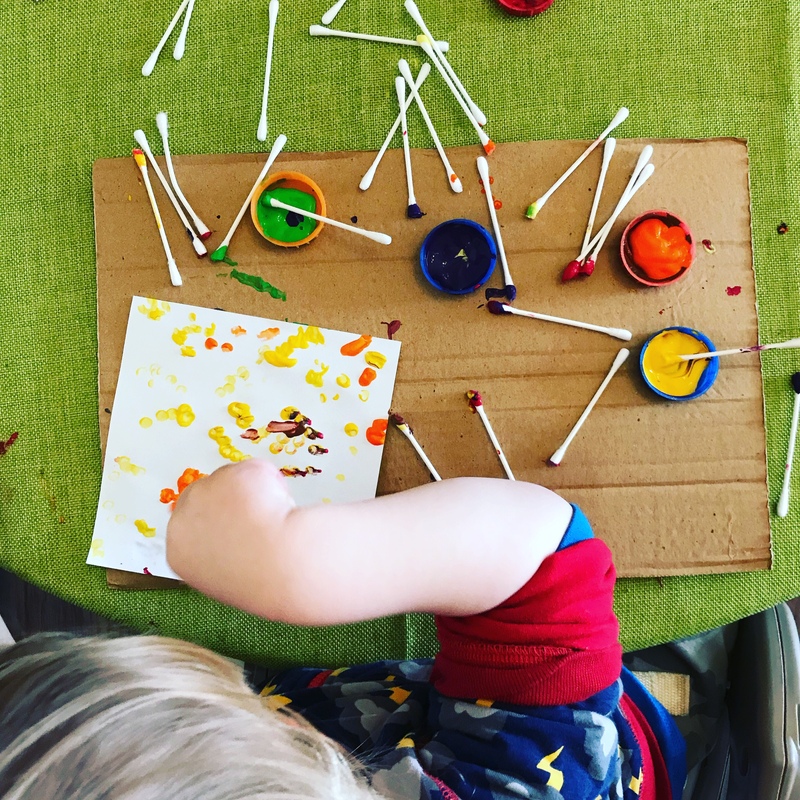 Painting with the cotton buds proved to be actually really versatile and a nice change from a brush – as well as great fun and using our saved milk bottle lids was perfect for limiting the amount of paint wasted too. This morning everything is dry and cut out and we now have some lovely colourful Easter themed bunting in the house and an afternoon of happy memories. Previous So bits of my house fell down! Thanks, I can’t believe how well the activity went down! It kept them quiet for over 2 hours!! !